GATE 2016 Registration Started- Reportedly, the applications for Graduate Aptitude Test for Engineering (GATE) 2016. GATE 2016 Application Forms are being accepted from September 01, 2015. 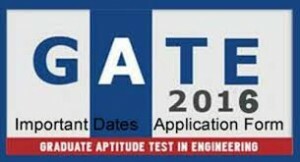 One of the most famous and competitive examinations, GATE, will be organised by Indian Institute of Technology, Kanpur. As usual, the test will be conducted at various centres. A significant number of students will be appearing for GATE 2016 to pursue Masters in Technology, Engineering or for obtaining Doctorates in different subjects, from good Indian colleges like IITs, IISCs. Look for the link that says “GATE 2016 online application”. Click it and fill the required fields. Go through the details once to check if they’ve been filled correctly. This is called proofreading the form. Necessary certificates like degree certificate, category certificate, and photographs are to be attached to the form as well. Also, you are supposed to take a print of the form, sign it, and then scan it to upload it on the website. Click on the submit button and there you go with the Registration for GATE 2016. An online computer based test will be held which will contain multiple choice questions. GATE 2016 exams are always held during forenoons and afternoons only on weekends i.e. Saturdays and Sundays. 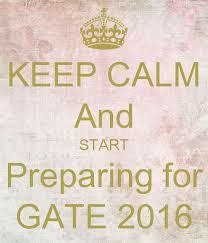 The dates for GATE are January 30th, 2016 to February 07th, 2016. The whole procedure of submitting the form, uploading documents, etc. will be done online only. Candidates are not supposed to send anything via courier or buy application forms offline. The fee payment will only be done via electronic mode or e-challan systems. The admit cards will also be only generated online and candidates will have to get a print out of the admit card to present it to the invigilator at the exam centre. A virtual calculator will be provided to the candidates at the time of the test. To verify the answers, the answer key will be uploaded on the official website, shortly after the exam dates are over. For Petroleum Engineers, a new paper has been introduced, thus making a total of 23 papers. Online registration opening date- September 1st, 2015. Hoping this article was helpful for you, I wish you all the good luck in the world. Stay relaxed and confident and you will achieve it! Previous articleTOEFL Preparation Tips 2015- How to Crack TOEFL? Next articleWhat Type Of Visa Do I Need To Become An Academic Student In The Country Australia? Sikkim CET & Non CET 2019 Notification: Important Dates, Application Form, Counselling Date, Admit Card.